Twecipes: Micro Recipe Bandwagon. Jump on? 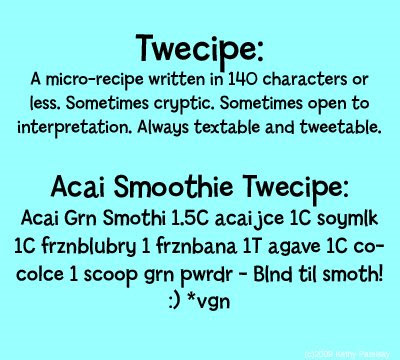 Twecipe Codes DefinedTwecipes are the latest internet trend in the foodie world. So what is a twecipe? Twecipe- A micro-recipe written in 140 characters or less. Sometimes cryptic. Sometimes open to interpretation. Always textable and tweetable. 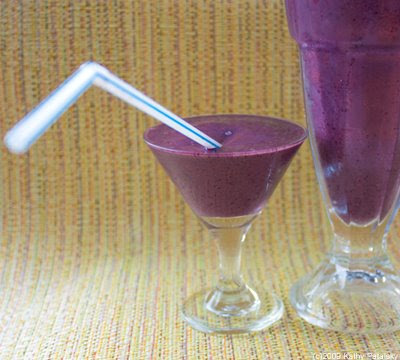 "Twecipe: Acai Grn Smothi 1.5C acai jce 1C soymlk 1C frznblubry 1 frznbana 1T agave 1C cocoIce 1 scoop grn pwrdr - Blnd til smoth! 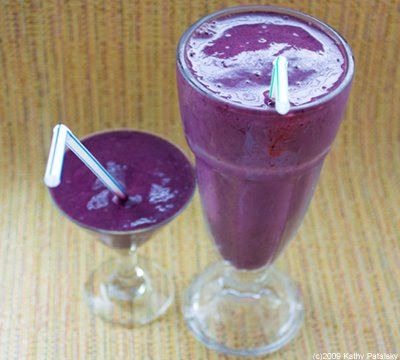 :) *vgn"
"PINA COLADA Fill blender 1/2 w/ice + C pineapple juice, ¼ C Coco Lopez (coconut cream), 1/3 C rum ~ blend til frothy.about 3 hours ago from HootSuite" -Martha Stewart Tweet. So if Martha is doing it, it has to be a "good thing" right?! I like this trend. It's fun, modern and challenging! Plus once you get the hang of it, you'll save a lot of time reading and writing out full length recipes! 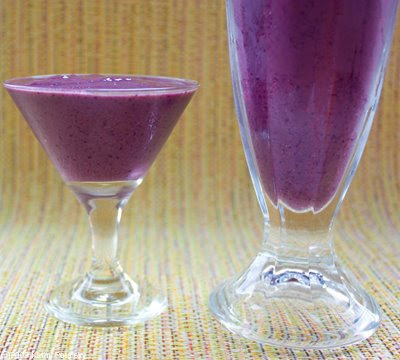 OK, so you'll probably have trouble twecipe-ing a full Thanksgiving Dinner, but for a few smoothies, sauces and entree recipes I think it's an awesome new idea. Do you have any twecipe lingo to add? Add it to the comments!